Jenolite Rust Remover & Preventer, circa 1954. Homepage. This page: This little leaflet dates to the early 1950s, and advocates the use of this rust removal product for motor vehicles. Jenolite Rust Remover and Preventer. Anyone who has spent time digging out corrosion from the underside of their classic car, van or lorry, will no doubt have heard of the Jenolite brand, a firm who's rust-treating products are still on the market. I believe that this leaflet dates to the early 1950s (1954 most likely), and it shows a moustachiod chap bulling up his motor-car. Scattered on the ground before him is a selection of hand tools, including a file, a hammer, and a chisel, all suggesting that some bodywork renovation was on the cards. A little birdie wishes to have "a word in your ear Sir .. about the easy way to remove RUST." Throughout the early 1950s, many pre-war cars were being dusted off after years spent hibernating away during the war. Despite many of them being in less-than showroom condition, keen DIYers would do whatever they could to extract a few more months from their old crocks, until such time as a new car could be acquired. Of course some people actively sought out older cars to renovate and use, just as some brave souls do to this day. Then, as now, this select band of motorists were scathing about brand new cars, their exorbitant price tags (not forgetting the hefty Purchase Tax), and their flimsy lightweight construction when compared to older vehicles. Therefore whereas some people gazed in awe at gleaming new 50s creations such as the Standard Vanguard, or Vauxhall Wyvern, these non-conformist types instead opted to focus their attentions on something altogether older, and often more engaging. Many of these old crocks would soldier on for years with decaying bodywork, their substantial chassis holding things together for the most part. Chicken wire and concrete could often be found shoring-up an older car, at least until the introduction of the Ten Year Test in 1960. But during the 1950s it was definitely a case of "mend and make do", and a little body rot would do nothing to deter the enthusiastic owner from driving their steed. A raft of products were available to help this happen - body fillers, to plug up unsightly holes, underseal, to hide evidence of previous bodges, and rust converters, to slow down the rampant nashing of the rust bug's teeth, were all good sellers. 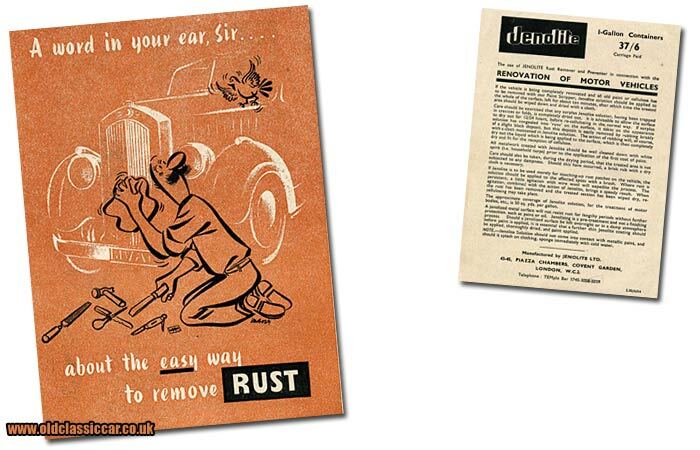 Recognising that many people were attempting to renovate older cars in their domestic garage, Jenolite distributed this leaflet to the motoring masses, advocating the use of their rust removal and preventative coatings. The solution could be applied to bare metal, being prepared for paint, or steel that already bore evidence of the tin-worm's tastebuds. "If the vehicle is being completely renovated and all old paint or cellulose has to be removed with our Paint Stripper, Jenolite solution should be applied to the whole of the surface, left for about ten minutes, after which time the treated area should be wiped down and dried with a cloth." "If Jenolite is to be used merely for touching up rust patches on the vehicle, the solution should be applied to the affected spots with a brush. Where rust is persistent, a little agitation with wire wool will expedite the process. The agitation, combined with the action of Jenolite, brings a speedy result. When the rust has been removed and the treated section has been wiped dry, re-cellulosing may take place." A 1 gallon tin of rust preventer would have cost 37/6, so a private individual may well have clubbed together with other owners of rusty old cars, and bought a tin between them. How effective such products were probably depends a great deal on how they were used, and just how badly corroded the car's body really was. 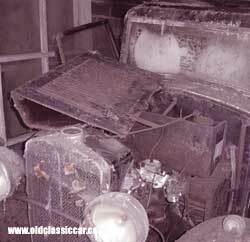 Pre-war cars, with separate wings and running boards, often rotted away behind the rear wing mountings, and the rot could be well advanced before it was eventually spotted. As 20 year old cars were not worth a great deal in the early 50s, and spare cash for repairs was often in short supply, many owners had no choice but to lash-up the cars as best they could, and hope that they'd survive another 12 months of use. But once rot had taken a hold, the clock was ticking, and soon no amount of rust converter would save it from the oil-stained clutches of the local scrap metal dealer, his greasy dog, and the unsympathetic attentions of the cutting torch.